Two dinosaur footprints showing incredibly detailed skin impressions. Fossilized dinosaur footprints are fairly common in the paleontological record, but a mere 1 percent of these tracks exhibit evidence of skin. Of these, none have been found to preserve evidence of skin across the entire footprint—until now. 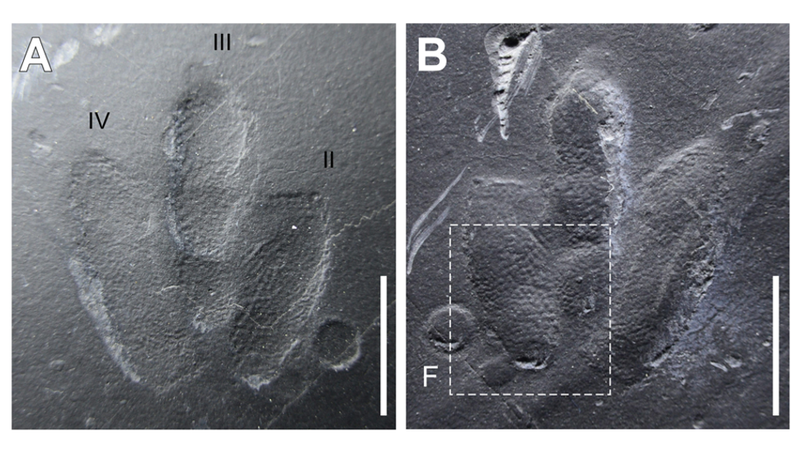 New research published in Scientific Reports is “the first report for any dinosaur of skin traces that cover entire footprints, and every footprint in a trackway,” according to the authors of the new paper. The impressions, called Minisauripus and made by a small two-legged dinosaur, represent the “highest resolution of detail yet recorded for any dinosaur skin impressions,” noted the researchers, a team led by Kyung-Soo Kim of South Korea’s Chinju National University of Education. To be clear, the name Minisauripus isn’t used to describe a specific species of dinosaur, but instead is an ichnotaxon, a name that categorizes distinct trace fossils like footprints. These incredible footprints were pulled from the Jinju Formation of Korea, and they’re embedded on a slab of very fine grey sandstone with a thin layer of black mudstone on top. The new paper describes four distinct tracks along a single pathway, plus an isolated fifth track from an unconnected slab. These surfaces were traced on clear acetate film, photographed with low-angle light, and measured to the nearest millimeter. Special environmental conditions allowed for the footprint to appear without smearing. The little dino walked across a thin layer of fine mud that was similar to “a coat of fresh paint only a millimeter thick,” Martin Lockley, a paleontologist from the University of Colorado Denver and a co-author of the new paper, said in a statement. This proved to be a perfect medium for recording the animal’s skin texture. What’s more, the sticky surface prevented the dinosaur from slipping or sliding on the surface, which would have ruined the integrity of the print. Indeed, the level of detail in these impressions is nothing short of extraordinary, and it’s hard to believe they were made so long ago. Arrays of small scales, each less than half a millimeter wide, cover the entire surface of the dinosaur’s tiny feet. The tiny scale traces, described as polygons in the new paper, together look like woven fabric. The researchers said the pattern is similar to those seen on some feathered Cretaceous birds from China, but the shape of their feet is very different. Also, the patterns are similar to, though considerably smaller than, those seen in the partial footprints left behind by larger dinosaurs, such as the brontosaurus. The “size of polygons in skin ornamental is proportional to track size,” wrote the authors in the paper. Based on the stride length and size of the footprints, the authors estimate a body length for this particular individual at 28.4 centimeters (11.2 inches). The dinosaur made long strides as it swiftly moved across the muddy surface at speeds reaching 2.5 meters per second (5.5 miles per hour). Human walking speed is about 1.4 meters per second, or about 3.1 miles per hour. An interesting feature seen in the new prints is how the dinosaur’s skin stretched between its toes. The “looseness and flexibility of the skin may have been a factor in allowing it to spread when contacting with the [mud] so as not to shift or slide and smear the fine skin traces as they were registered,” wrote the authors in the study. Correction: A previous version of this article incorrectly described Minisauripus as the species of dinosaur, when in fact it is an ichnotaxon, the name of a distinctive trace fossil. We regret the error. Thanks to commenter Zach Miller for pointing this out.